Themed bullion coins are wildly popular with both collectors and investors alike, and the Canadian Superman Silver Coin is no different. Beloved by those who’ve grown up watching Clark Kent’s adventures as the Man of Steel, and valued by investors for the ease with which they can be resold to collectors, these beautiful Superman Silver Coins minted by the Royal Canadian Mint (RCM) are truly one-of-a-kind. 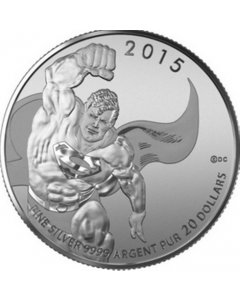 The 2015 Superman Silver Coin, for sale at the lowest price online, is made of one ounce of 99.99% fine silver. The reverse shows Superman in flight, his cape billowing behind him, and the classically framed “S” of his costume in clear detail as he heads off to save the day. It is marked with the year, as well as the 20-dollar currency value. The 2016 Canadian Superman Silver Coin is a full ounce of 99.99% fine silver, and ships in singles, collectible tubes of 25, or sealed Monster Boxes of 500 or more. This coin features Superman’s shield on the reverse, with the word Canada above, and the metal information below. In the background is a micro-engraved safety design, and the obverse shows Queen Elizabeth II, as well as the 5-dollar currency value and the year of minting. If you’ve been waiting for the perfect opportunity to introduce a child or young family member to investing in precious metals, buy Superman Silver Coins before they sell out! This is a perfect way to connect with the young superhero lover in your life. The Superman Silver Coin, for sale here on SD Bullion, is one of the most popular themed coins ever seen. And for investors, the Royal Canadian Mint is one of the best mints in the world, known for producing the highest quality silver bullion. In addition to being easy to sell to collectors in the future, these silver coins are an excellent portfolio builder. Pick up some unique Royal Canadian Mint Silver today and watch the silver prices soar with Superman!